Scientists in Mongolia have discovered a new oviraptorosaur species that lived around 100 million years ago during the Late Cretaceous. Gobiraptor minutus, named after the Gobi Desert where it was found, resembled a huge chicken with no teeth. 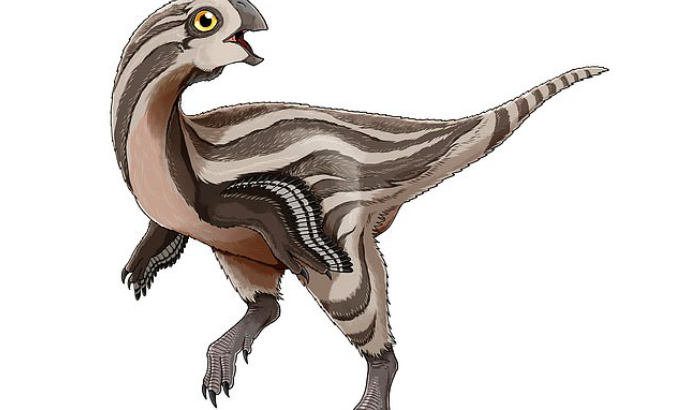 The lack of teeth suggests that the dinosaur would have been an herbivore, but a team of experts led by Seoul National University has concluded that Gobiraptor minutus ate both plants and animals. To compensate for a lack of teeth, the dinosaur was equipped with powerful, enlarged jaws that were likely used to crush eggs, seeds, mollusks, and other hard items for feeding. Oviraptorosaurs typically grew up to 11 feet in length and weighed up to 500 pounds with long legs, huge feet, and claw-tipped arms. Even though many oviraptorosaur skeletons have been found in China and Mongolia, their diet and feeding strategies have remained a mystery. Among this diverse group of dinosaurs, Gobiraptor minutus is distinctive because of its extra thick jaw structure. “A new oviraptorid dinosaur Gobiraptor minutus from the Nemegt Formation is described here based on a single specimen that includes incomplete cranial and postcranial elements,” wrote the study authors. The study is published in the journal in PLOS ONE.